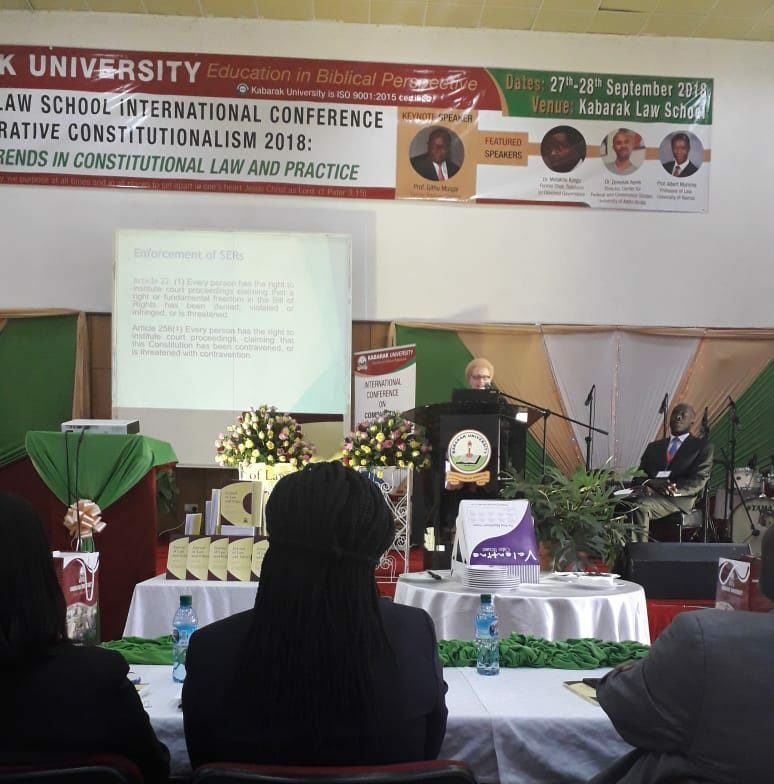 On September 28, 2018 (Friday), WYA Africa Regional Director Patricia Gwambo represented the region at the 1st Law Conference organised by the Kabarak Univeristy School of Law in Nakuru, Kenya with theme ‘Comparative Constitutionalism; Recent Trends in Constitutional Law and Practice’. The two-day conference kicked off with great anticipation as different experts in the legal field in Africa delivered talks on matters related to the constitution of Kenya. Some of the notable speakers were Kenya’s former Attorney-General Githu Muigiai, former Commissioner of the Commission on the Implementation of the Constitution Kamotho Waiganjo, the Dean of the Kenyatta University School of Law Dr. Linda Musumba, a Senior Lecturer of Strathmore Law School Dr. Osogo Ambani and Lady Justice Mumbi Ngugi from the High Court in Kericho. These were only a few of the great academics and legal practitioners who were part of the conference. WYA Africa, as a partner organisation to the School of Law, is keen to be part of such activities as they build on the regional office’s work in the field of advocacy. Some of the key points from the conference was the need to make Article 43 real in Kenya by looking at the social economic situation of the human person and ensuring human dignity is upheld in meeting this article’s requirements. The conference closed with the wise words of the Vice Chancellor borrowed from the Swiss Psychologist Jean Piaget: “The principle goal of education in the schools should be creating men and women who are capable of doing new things, not simply repeating what other generations have done; men and women who are creative, inventive and discoverers, who can be critical and verify, and not accept, everything they are offered.” WYA Africa was also honored to witness the launching of one of the 3rd volume of the Journal of Law and Ethics by the Centre for Jurisprudence & Constitutional Studies with the Strathmore Law School Press. We are thankful to Kabarak University for the opportunity to be part of this great conference and we look forward to engaging more in the future.